Friday evening:[/B] SOEC Members, Non-Members and Guests Dinner (casual meet with locals and out-of-towners; pay-your-own way). Meet at Saleen at 5:30 p.m. Comfortable accommodations at a special $75 bargain price, it's only 1.4 miles away on the other side of the 91 freeway and up Frontage Road. Special Saleen rate $75 includes breakfast. All rooms have microwave, fridge and coffeemakers (with coffee) and free wireless. You save $24+ over their regular rate. Double occupancy rooms with double-doubles or a king. Inquire at the time you make reservations for the best room layout that suits your needs. Free parking. Some room for trailers (inquire at desk). There is a do-it-yourself car wash nearby off 6th Street. Last edited by Saleen Forums News; 08-02-2013 at 12:25 PM. where is the other show? 08 S302E Coupe #01 "Black Ops" USSOCOM Tribute Car. Sponsored by 281 Motorsports, HRE, Cortex, BMR, Aeromotive, Barton, ACT, SCT, Schroth, CSF & Toyo Tires! Mods to numerous to list! God bless our Special Operations Soldiers and their families! Santa Margarita Ford -- Orange County Mustang Club is organizing, and it's for a good charity.... registration form coming soon! There is also another show nearby on Sunday, September 15, so plan for staying in the area the whole weekend! 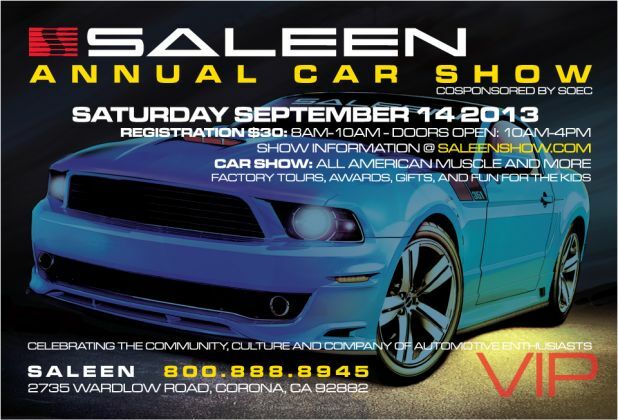 Signed Up For The Saleen Show! Should be a blast! Looking forward to seeing everyone there! If you have a driver that you don't want to spruce up for the show, we still encourage you to register and be "Display Only - Not Judged!" Pre-registration at $30 is open until midnight! This is a great event, with some very special surprises, and you'll get a great goody bag that's worth almost that much alone! Wish I could be there with #22! At least she made it to Carlisle this year! Will be there in spirit! Have a great time! Wish you could attend -- we'll miss you, Bob! This is going to be the biggest show in years -- and the Saleen campus looks better than ever!